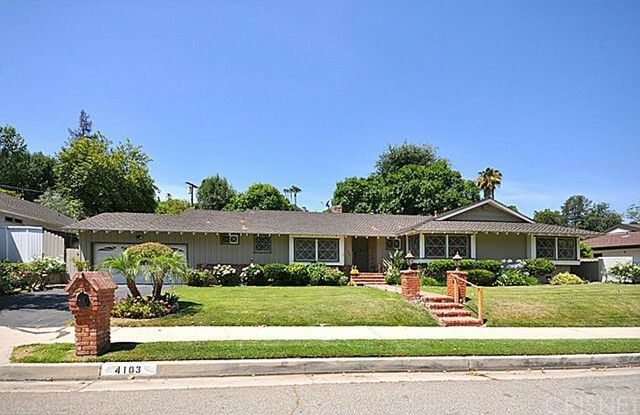 Description: excellent encino location in the highly desirable hesby oaks k-8 school district. straight from the vineyards of tuscany. upon entering you will find yourself in a quintessential italian villa including a grand formal living room, adorned with walnut wood floors, soaring ceilings, central fireplace, beautiful architectural detailing and recessed lighting.the ambiance of this traditional 4 bedroom 4 restrooms home has the ideal flow for entertaining and gatherings of any kind. kitchen is open with well-crafted wooden cabinetry, gorgeous granite counters, an island, double oven, charming breakfast nook and french doors that lead you outside to the beautiful backyard!spacious bedrooms with triple and double paned windows that beam in natural lighting. gracious master with walk in closet, dual sinks with onyx counter tops. tranquil backyard with a wonderful pond equipped with a cascading waterfall, sparkling pool, jacuzzi and a green plush lawn. the beautiful landscaped front yard will welcome you every day with plenty of parking space and mature trees.this beautifully remodeled home is a must see-nearby shops, restaurants, and places of worship.other features include: 2 sump pumps, 2 separate heating and airconditioning systems, double car garage, Listed By: Shoshana Kliman of Johnhart Corp. Description: *** just reduced 50k *** $491.91 sq ft. new roof. remodeled 3+2.5+fdr. large fr/office or 4th bedroom w/2,844 sf on a 15,177 sf private lot.gorgeous encino hills contemporary home w/city lights view and large pool. located in highly coveted lanai road elementary school district. quiet cul-de-sac location minutes to the westside. beautiful frosted glass door entry welcomes you to a formal foyer w/a light and bright open floor plan. large lr w/fp. large family room w/fp and flexible use as bedroom on first floor, 2 sets of glass sliders to pool grounds and private side court yard. second level w/3 bedrooms including a master suite w/a balcony for city light views and luxurious resort style bathroom w/spa tub and seamless shower enclosure w/glass accents for a modern flair. fabulous private pool grounds w/patio areas ideal for entertaining. Listed By: Ramin Abrishamchian of Exclusive Realty Inc. Description: prime encino cul-de-sac south of ventura blvd. gated estate with pool, spa and private grounds. open living and dining room with fireplace, large kitchen with breakfast room. huge family room has a second fireplace and wet bar. lower level bedroom or maids room with separate entry. unlimited potential in a multi-million dollar neighborhood. Listed By: Barry Dantagnan of Coldwell Banker S.o.